Brenda Fedoruk is currently Principal Flute of the Vancouver Opera Orchestra, a position she has held for more than 20 years, and a core member of Vancouver's esteemed Turning Point Ensemble. As a long time member (Flute and Piccolo) of the CBC Radio Orchestra, she was also the Musicians' Contractor until the orchestra's disbanding in 2008. A busy free-lance player, she has performed often with the Vancouver Symphony Orchestra, has been Guest Principal Flutist with the Victoria Symphony Orchestra, and has played with the touring orchestras of the Royal Winnipeg Ballet and the National Ballet. Ms. Fedoruk has performed in many major musical productions including the Vancouver productions of Les Miserables, Showboat, Sunset Boulevard, Ragtime, Phantom of the Opera and Mary Poppins. Ms. Fedoruk has recorded for commercial film and television projects, including the weekly television series Lonesome Dove and several Disney Films (Chestnut: Hero of Central Park, Spymate, AirBud, MVP, Space Buddies, Once Upon A Mattress). In addition, she is active as a chamber musician and soloist in the greater Vancouver area. Ms. Fedoruk has been featured in chamber music recitals at the University of BC., Capilano University, Vancouver Community College, Douglas College, Silk Purse Gallery, Old Schoolhouse Concerts in Qualicum Beach, and West Coast Chamber Music. She has performed as Artist-in-Residence at the Hornby Island Music Festival and in many Vancouver area concert halls as a member of Vancouver's most respected new music ensemble, the Turning Point Ensemble. Ms. Fedoruk holds a Bachelor of Music degree from the University of British Columbia, where she graduated first in her class. Extended studies have taken her to the Konservatorium und Musikhochschule in Zurich, Switzerland and to Toronto where she was one of two Canadian flutists selected to participate in the Orchestral Training Program administered by the Royal Conservatory of Music. Her formative teachers include Camille Churchfield, André Jaunet, and Paul Douglas. Summer studies have taken Ms. Fedoruk to the Mozarteum in Salzburg, Austria, the Juilliard School in New York and to the Banff Centre, where she participated in masterclasses for six consecutive years. As well, Ms. Fedoruk has attended the Scotia Festival of Music in Halifax, the Grand Teton Festival in Wyoming and as a scholarship student at the Johanneson International Summer School of the Arts in Victoria. She has participated in major masterclasses and seminars with Jeanne Baxtresser, William Bennett, Marcel Moyse, Julius Baker, Robert Aitken, Trevor Wye, Timothy Hutchins, Thomas Nyfenger, Samuel Baron, John Wion, Peter-Lucas Graf, Julia Bogorad, and John Krell. In addition to her performing career, Ms. Fedoruk is a dedicated and busy teacher. She is currently a member of the faculty of the School of Music at the University of BC where she teaches flute and chamber music. In addition to her teaching duties at UBC, Ms. Fedoruk is a faculty member of Vancouver Community College, Capilano University, Douglas College, and the Vancouver Academy of Music. She is in demand as an adjudicator and has adjudicated at many music festivals in British Columbia and in the United States. Many of her former students have gone on to hold orchestral positions, establish chamber music ensembles and teach at schools, universities and conservatories in Canada and internationally. Ms. Fedoruk has taught for many summers at the West Coast Amateur Musicians' Society Summer Festival in Langley, BC. She has also served on the faculties of the Courtenay Youth Music Centre, Okanagan Summer School of the Arts and the UBC Summer Music Institute. 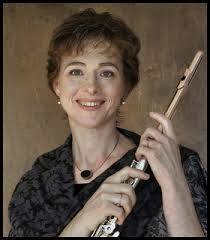 Ms. Fedoruk has been the Conductor and Music Director of the Capilano Flute Choir since 1993. The Capilano Flute Choir is an adult amateur ensemble. Performing on all instruments in the flute family (piccolo, C flute, alto flute and bass flute), the CFC presents several concerts each year at elder care facilities and community events. Ms. Fedoruk's discography includes many CDs on the SM5000 series with the CBC Radio Orchestra, several discs on the Artifact, Atma and CentreDisc labels with the Turning Point Ensemble, the Skylark label with Chor Leoni and the Elektra Women's Choir and several private labels featuring The Vancouver Men's Chorus and music by Three Hornby Island Composers. Ms. Fedoruk's first solo CD, I Remember, with mezzo-soprano Sarah Fryer is now available. This highly acclaimed disc features two world premier recordings: Michael Cohen's From the Wall and Owen Underhill's Remember.